Mother Daughter Tea 2018: Pajama Party! 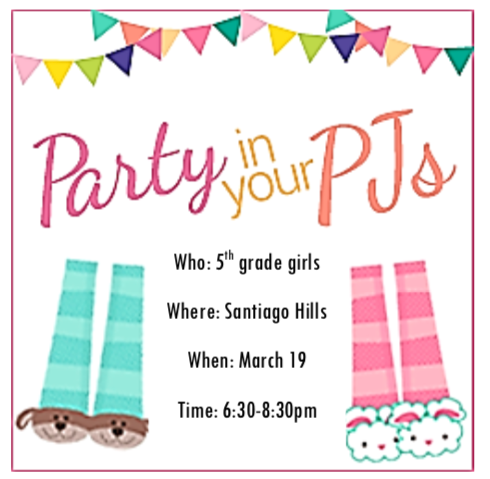 Santiago Hills Elementary PTA will be hosting our annual 5th grade Mother Daughter Pajama Party on March 19, 2018 from 6:30-8:30pm. This special event brings mothers (or special adult female friend) and daughters together to celebrate girls growing into young ladies. The event will be held at Santiago Hills and is an Irvine Unified School District approved program sponsored by the PTA. During the event, mothers and daughters will have the opportunity to come dressed in their pajamas, enjoy special refreshments, participate in activities, and listen to a guest speaker talk about the changes they will experience as they become young ladies. Please sign-up to donate items or volunteer for the event using this google doc link. https://docs.google.com/spreadsheets/d/1oRU26B0ZBbZpDH2_iF7un8TnXqBF4ve41uZwGSJtKes/edit?usp=sharing We encourage 4th grade moms to attend as well to know what to expect for their girls the coming year. If you would like to promote your business through sponsorship or donations for gift bag items, door prizes, or refreshments we would love to hear from you! For more information, questions, or comments please email motherdaughtertea@santiagohillspta.com. More about the Mother Daughter Tea at our official program page here. Previous story 2018-19 PTA Needs a Treasurer!